Our much missed friends from the south of France were over for their half term, which annoyingly didn’t coincide with Missy B’s holidays at all. We took the girls out for a joint birthday bowling trip with some old mates on Saturday and then they all came over for Sunday lunch. The French lot, that is, not all the teen chums as well. 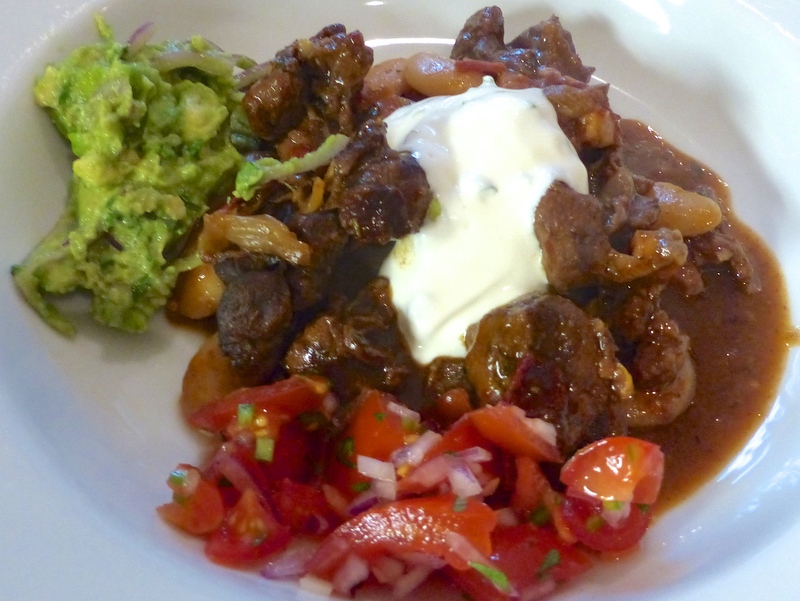 I made Ottolenghi’s spicy venison stew with guacamole from the Guardian. I took seriously the great man’s point that he tests the recipes for a reason, so I followed the ingredients to the letter. I did stray from his method a bit, because I just fancied having another pan of Julia Child’s shallots to nibble at while I worked. The only risk with this is that it would be entirely possible for me to eat two whole bags of shallots before they make it into the stew. I am pleased to report that I exercised extreme restraint and most of them survived and made it into the pot with the venison. That worked well – and I hope Ottolenghi wouldn’t be too annoyed about me going off on this little frolic of my own. In case you are wondering, you peel the shallots, sauté them gently for about 10 minutes in some butter and olive oil then chuck in a glass of wine (red or white), water or stock and a bouquet garni and cook on a very low heat for about 40 minutes. Keep an eye on them as they could burn. Or someone might eat them. The stew was totally lovely – very rich with tender meat and, of course, those lovely shallots. It’s going well, this lapsed vegetarian thing. The stew was a bit spicy for the children, so we let them have emergency pasta and pesto. Not sophisticated, but they were happy. As well as guacamole and sour cream, I made a little tomato salsa (big and small tomatoes), chopped but not peeled, half a red onion finely chopped, a green chilli, also finely chopped, fresh chopped coriander and the juice of half a lime. Plus some sweetcorn fritters, as I thought, correctly as it turned out, that these would go down well with the children. Dessert was, by special request from Missy B, a large red velvet cake, to celebrate the various birthdays that have happened since the beginning of the year. 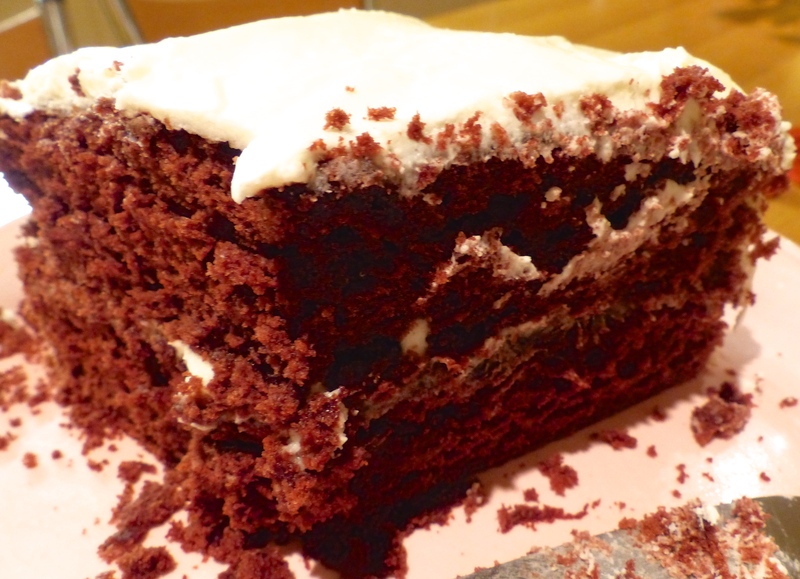 I used a recipe from the Hummingbird book this time – very light and a possible contender for category 51 “anything goes” at this year’s Muswell Hill Horticultural Society Spring Show, baking section. 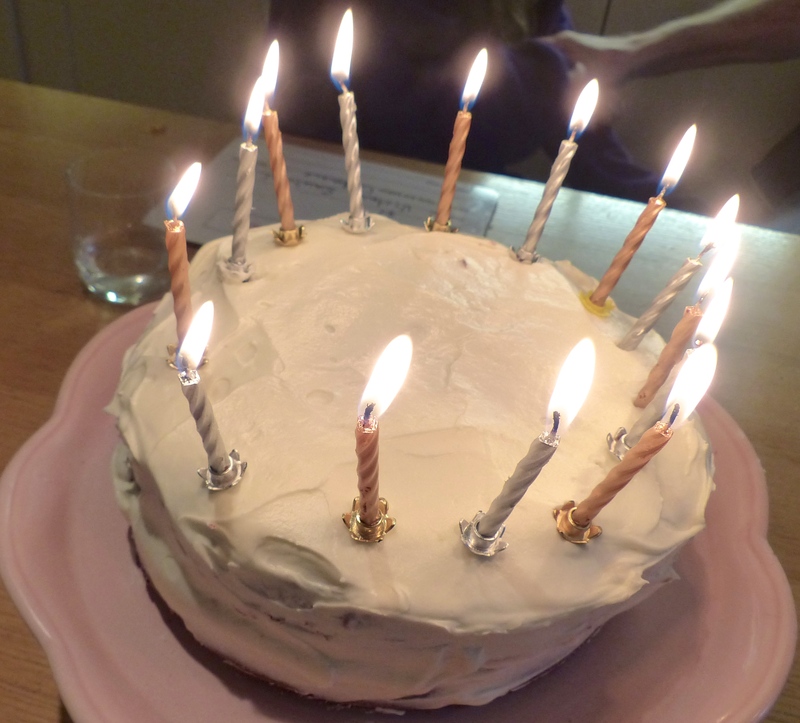 After my triumph with a pear and amaretto cake last year (also an Ottolenghi inspired dish) I don’t know which cake to make and anyway, in case Jenny is reading, I can’t reveal my final choice until the day, as we have agreed to keep this one a surprise. Suggestions welcome!! I think you should leave it to the day of the show, try an elaborate cake you have never tried before that turns out after the event to have a big mistake in the recipe about the temperature of the oven and the baking time. Venison sounds very good. Better than the Galloping Gourmet’s recipe? Yeh – good idea. I’ll randomly pick a page from Roger’s World’s Greatest Cakes book and see how I fare. Not. Venison was lovely – I may now head back to the Galloping Gourmet to check out that recipe by way of comparison. You will be invited to partake. Loving the venison. May have to revisit my aversion to browning meat. Hmmm – that looks so good. I will get around to that at some point – what a great way to use up the left over festive sugared almonds!